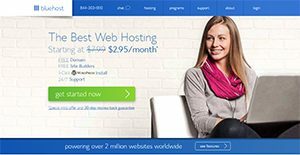 A cloud-based web hosting service popular for its flexible pricing plans, Bluehost offers shared hosting, virtual private servers and reseller hosting options, along with domain registration. It has an easy-to-use interface, unbelievably low pricing plans and a single-click installer for those who use WordPress. In fact WordPress.org recommends the use of Bluehost, citing easy installation and management. Not only is the platform affordable, it also provides lower-tier users with advanced features and excellent support as it would advanced ones. What’s great with the service is that it can help you exploit the most out of Google and Bing advertising. It also offers in-house services using its own fiber connections, data centers and Linux kernel running on custom servers. Bluehost’s web hosting plans are quite generous especially in terms of bandwidth. These packages entail extremely high bandwidths and storage space at very low prices. The service’s web hosting plans are offered on shared servers, with prices depending on how contract length. These are ideal for PHP applications that require light CMS installs, like WordPress, Joomla and Drupal. Aside from these, you can be sure that your website will run all the time and is always protected. The vendor provides users with power backups with the use of UPS and diesel generators while regular backups of user accounts are done regularly. Cloud-based web hosting service Bluehost is widely popular for its flexible pricing plans. The service is a provider of shared hosting, VPS and reseller hosting services. It likewise provides domain registration services to those who require them. Known for its low pricing models, the service provides users with an interface that is easy to use and a single-click WordPress installer. The service, in fact, is WorldPress.org’s recommended web hosting owing to its easy installation and management. Bluehost has a lot of features and functionalities that you are bound to like. It can help you make the most out of both Google and Bing advertising. Aside from its affordability, the platform views all users as equal, providing lower-tier users with advanced features and support that advanced users get. In-house services are also in the offing, using the service’s proprietary fiber connections, data centers and Linux kernel that runs on its custom servers. What makes things even better is that Bluehost web hosting packages offer extremely high bandwidths and storage space. Offered on shared servers, the platform’s web hosting plans are priced depending on contract length. The service is ideal for those who use PHP applications that need lightweight CMS installs, such as in the case of WordPress, Joomla and Drupal. Another great thing about Bluehost is that you can be assured that your website is up at all times and is always secure. This is true as the vendor provides power backups using UPS and diesel generators. Regular user account backups are also implemented. But in the event that you do find fault in the services power backups and decide to withdraw from the service, the vendor has a toll-free refund policy that you can use. However, the vendor has absolute control over all the facets of its services that the possibility of failure of power backups is virtually remote. BlueHost’s shared hosting packages are offered with Cpanel as standard: this is included in the basic hosting price. The Cpanel features different webmail options if you prefer to access your email this way, as well as all the usual Cpanel controls for managing add-on domains, checking your IP address, and setting up name servers. The Cpanel is provided alongside a number of other features in a customized Bluehost control panel. Cpanel is the first in a number of tabs that offer access to domain search and domain management, site builders, upgrades, dedicated IP settings, Postini anti-spam software, profile and billing details screens, and SSL certificate administration. Some of these features cost extra. There are two separate Bluehost control panels: the Cpanel tab and the rest of the admin screens. Both are tightly integrated and accessed from the same login, making administration straightforward. Each company has its own characteristics, and may call for a special solution that will be fit for their business size, type of clients and staff and even specific industry they cater to. We advise you don't count on locating an ideal service that will work for each company regardless of their history is. It may be a good idea to read a few Bluehost reviews first and even then you should pay attention to what the hosting service is intended to do for your business and your employees. Do you need a simple and straightforward hosting with just essential features? Will you really make use of the complex functionalities required by experts and large enterprises? Are there any particular tools that are especially beneficial for the industry you work in? If you ask yourself these questions it is going to be much easier to get a reliable service that will fit your budget. We realize that when you make a decision to buy Hosting Services it’s important not only to see how experts evaluate it in their reviews, but also to find out if the real people and companies that buy it are actually satisfied with the product. That’s why we’ve created our behavior-based Customer Satisfaction Algorithm™ that gathers customer reviews, comments and Bluehost reviews across a wide range of social media sites. The data is then presented in an easy to digest form showing how many people had positive and negative experience with Bluehost. With that information at hand you should be equipped to make an informed buying decision that you won’t regret. BlueHost offers 24/7 support through phone, live chat, and email, all linked through a central helpdesk portal. The helpdesk employees are located in Provo, UT. Telephone support is toll-free inside the US, and there is a second number for non-US customers. The support portal offers a knowledge base, user forum, and video tutorials to help fix known issues. The portal also offers at-a-glance access to the server status page. What are Bluehost pricing details? Bluehost’s servers use only Linux. It does not offer Windows hosting. Bluehost offers unlimited storage space for most of its plans. But there is a fair usage limit which you cannot exceed. Bluehost offers Weebly which is a drag-and-drop website builder that doesn’t require any coding knowledge. The vendor says they manage every aspect of their servers in the data centers and continuously monitor security threats and use updates to protect against them. Bluehost is great for WordPress hosting as it offers comprehensive support including 24/7 phone support, live chat, and thousands of knowledge base articles to help even beginners. Yes, Bluehost offers one free domain registration for one year with all their hosting plans. Bluehost offers many features for e-commerce websites. They partner BluePay so you can use your Bluehost account to set up a credit card merchant account to process payments on your website. It also offers an SSL certificate. Bluehost does not offer an uptime guarantee and does not reimburse for downtime. All plans of Bluehost include CPanel. Bluehost accepts credit card and PayPal payments.